Coral Reef in Raja Ampat Islands. 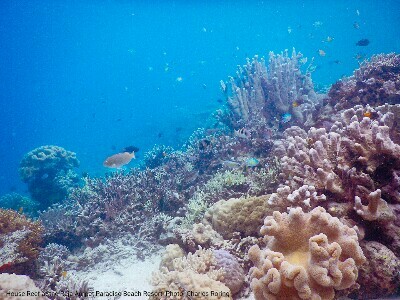 I often organize snorkeling tour from Waigeo to other islands in Raja Ampat. 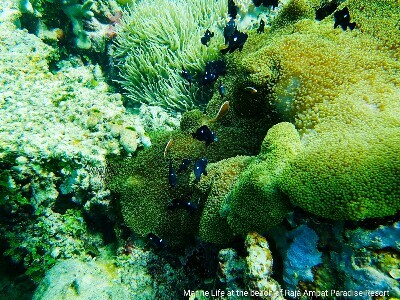 This tour is suitable for visitors who want to see coral reef and tropical fish of West Papua. 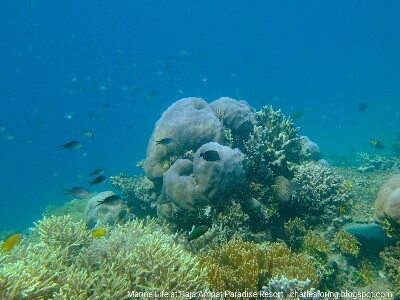 Visitors can enjoy snorkeling in several coral reef sites during the whole trip. Recently I did a 4 days/ 3 nights snorkeling and birding trip in Waigeo. For snorkeling, I spent my time in the coral reef area in southern part of the island. I went to the drop-off reef by an outrigger canoe paddled by a villager. The distance from the beach is around 60 to 70 meters. The reef that was closer to the beach was flat. The inclination of the reef drop off was quite steep, approximately 50 to 70 degrees. It did not take long to reach the coral reef. I wore my swimfins, and mask. At the drop off tip of the reef, I got off the canoe and slowly immersed into the sea water. I slowly dived to deeper water around 5 to 7 meters below the surface. I held my breeth for nearly one minute to take pictures of the marine life. Fish was everywhere, abundant, and colorful. I returned to the surface and then dived again several times. When fog covered my mask, I decided to return to the canoe to clean it. I asked my canoe driver to add some drops of shampoo on to the glass. And then rinsed it with mineral water. When I dived, I could see clearer again. I replaced the previous camera with Fujifilm XQ2 and then started to take pictures. I saw a few Pink-Spot Anemonefish and Three-spots Dascyllus. I approached them carefully until a distance of less than one meter. I liked to dive to a depth of around 5 to 7 meters.Taking underwater photos while doing freediving was a nice experience. My time in the water was limited to approximately 1 minute. I saw a lot of fish including banded damsel, snapper, anthias, butterflyfish, coris, moorish idol, soldierfish, parrotfish, sweepers, grouper, and pink anemonefish. In addition to fish, there are also sea stars, sea cucumber, and other interesting marine creatures in the water. To take the trip, visitors need to bring their own snorkeling mask, flippers, and if possible a waterproof underwater camera. I used Nikon W300 and Fujifilm XQ2. Because of its small size, handling the Nikon W300 camera in the water is relatively easier. Going back to the beach, I felt very thirsty. My canoe driver climbed a coconut tree and took some of its fruits. We also grilled a big trevally for our lunch. It was a nice picnic experience for me. Yes, Raja Ampat is a beautiful tropical paradise.